There are so many intriguing headlines in the Association as the calendar turned to 2015 and I have really enjoyed there always being a good matchup nearly every night between two fun teams to watch. It’s easy to talk about the Cavs or Spurs recent struggles (I’ll address that in April when both are actually relevant), as well as my boys “The Greak Freak” and “Video Game Dame” (love the Lillard nickname Jalen Rose). That’s right folks, Detroit Basketball is back and it is so interesting when you try to explain why they have gone on this mini-winning streak. I cannot believe it took me this long to mention the real reason this team is being turned into a true contender before our very eyes: Stan Van Gundy. Van Gundy has found a way to completely change the culture as the head coach AND President of Basketball Operations in his first seven months in Detroit. A lot of it has to do with one man being given 26 million dollars to just go away. 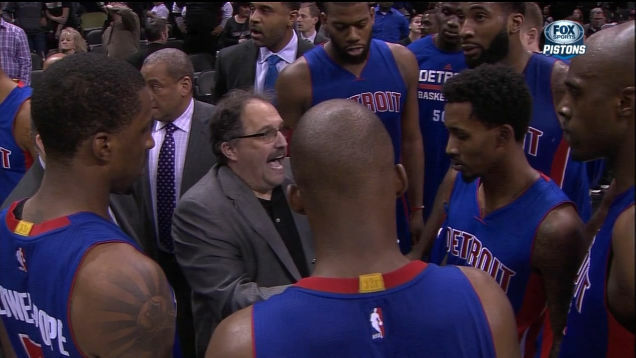 I bet Van Gundy volunteered to pay the rest of Josh Smith’s contract after what he was doing to the team. My head felt the same way Stan’s did when I watched him on the Pistons (minus the explosion part). Smith just seemed to not care that he was shooting a shot the other team actually wanted him to shoot. Other players have come out and said their plan was to let Smith shoot and watch him miss. You know something is up when an organization, that is as much of a business as it is a basketball team nowadays, pays a player to go away. The Pistons will be paying Smith through 2020, but it already seems to be working out for the better. Now I agree it is not all Josh Smith’s departure that has all of sudden transformed the Pistons into what looks like a playoff team. Stan Van Gundy’s input on player management has been talked about a lot, but Van Gundy’s coaching should not go unnoticed. I like the announcers chuckle when Stan swears, but his player’s reaction to the “Form a F***ing Wall” comment was the best part of the video. None of them blinked; Jodie Meeks can been seen nodding and agreeing as if he has heard stuff like this before. I really believe Van Gundy is tied with Tom Thibodeau in Chicago as the best current NBA head coach without a ring. Van Gundy came close to getting one as he lead the Orlando Magic to the Finals with a young Dwight Howard surrounded by a bunch of shooters, and I think he will be able to make the correct and necessary moves to get Detroit another championship. The comparisons between that Magic team that went to the 2009 Finals and this year’s Pistons team without Smith have been eye-opening. This article by Tom Haberstroh is an awesome read. Sure, it is a small sample size when trying to compare the two teams, but I believe the Pistons will play well enough the rest of the season to make the playoffs in the East. I know its the East so you might be thinking it shouldn’t be hard for them to get in. Well don’t forget the Pistons started 5-23 and are currently 14-24 through 38 games. They are currently only two games out of 8th place, but would have to go something like 24-20 through their last 44 games to reach a mere 38 wins, which will probably get them in. During this stretch where Detroit has won nine of ten they have beaten Toronto, Sacramento, Dallas. Let’s not forget to mention the huge win at San Antonio where “Form a Bleeping Wall” was said and Brandon Jennings won it on a runner with .1 seconds left. Notice in this string of events, the Spurs had the ball up by 1 with 8.0 seconds left. The Spurs just fouled Jodie Meeks up 3 (which I don’t agree with doing by the way) and Meeks made both. The Spurs called timeout to advance the ball, turn it over, and the Pistons lead by Jennings go the other way without a timeout and get a bucket. This young team had the presence of mind to go after getting the steal, and not one player even flinched thinking about calling at timeout. Stan clearly made it clear they were out of timeouts and the players have gone through this situation many times before. That is called good coaching my friends. The Pistons are not a championship team yet and definitely have some moves to make this year, but even Van Gundy has come out and said title teams start will small moves. I expect small moves to be made if the right one comes along before the February 19th trade deadline, and then a big decision will have to be made about unrestricted free agent Greg Monroe. If Monroe keeps playing the way he has since Smith left I strongly believe the Pistons will pay him and keep him around. Stan Van Gundy has this team and organization speeding towards seriously contending for a championship. The Pistons never really tanked and didn’t need to. Stock piling draft picks loses its value if everyone is doing it and those picks currently are being over valued. Its easier now than ever to do the opposite and build a contender if the right people are making decisions (just ask Mark Cuban how he got that Maverick’s starting five together). This entry was posted in 14-15 Regular Season, Home, NBA and tagged Brandon Jennings, Detroit, Detroit Basketball, Detroit Pistons, Grantland, Jalen and Jacoby, Jalen Rose, Jodie Meeks, Josh Smith, Pistons, Stan Van Gundy, The Pistons, Tom Haberstroh, Van Gundy, youtube. Bookmark the permalink. ← Where do Eagles, Cowboys go From Here?